You love a diverse landscape? The Alps are too high for you? You like being surrounded by historical walls? You like walking, cycling or horse riding? You would love to finish off a day full of variety with authentic Saxon cuisine? Then don’t miss out on visiting our region, which has been populated for over 1000 years. Historical town centres with aesthetically restored buildings await you in Mittweida, Penig, Rochlitz and Waldenburg. For active recreation, enjoy our various cycle and hiking routes, especially along the Chemnitz, Mulde and Zschopau rivers. 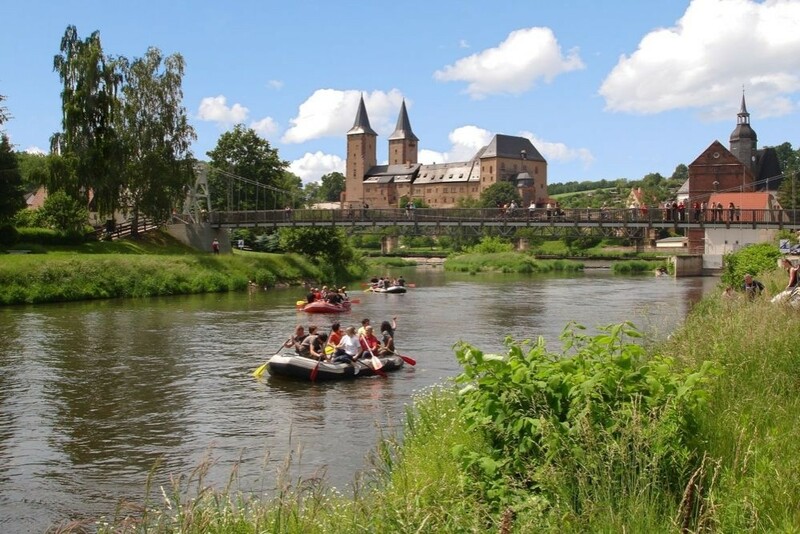 To train your body and strengthen your fitness, challenge yourself on the Keep-Fit-Trails (“Trimm-Dich-Pfade”) around the towns of Burgstädt, Geringswalde and Wechselburg. Resounding stream valleys and sunlit forest areas, fragrant cherry blossoms in spring, green meadows and golden fields in summer and colourful foliage in autumn offer idyllic scenery throughout the seasons. Take a few relaxing hours to wind down at the ”Kriebstein Reservoir” (“Talsperre Kriebstein”), situated in the narrow, wood-rich valley between the towns of Ringethal and Kriebstein in the heart of the legendary Zschopau River Valley. The picturesque reservoir has long been a magnet for nature lovers, participants of watersports and campers. The river, having cut deep into the countryside, has formed a wild romantic landscape and represents the most fish-rich of all Saxon waters. The county town Mittweida with its late Gothic church and its museums of Local History (“Heimatmuseum”) and Space Travel (“Raumfahrtmuseum”) is known for its Technical University far beyond Germany’s borders. It is not without reason that our region has been called “The Valley of Castles” (“Das Tal der Burgen”) for more than 60 years. Travelling from Waldenburg to Kriebstein via Rochlitz, you will find no less than 8 castles – there used to be even more. The castle museums in Rochsburg, Rochlitz and Kriebstein supply you with extensive information about the history of the buildings and their surroundings. While Rochsburg Castle with its keep, its deep well and its restored castle chapel from the 12th cent. was passed down between the generations of the Schoenburg dynasty from 1548, 1000-year-old Rochlitz Castle was, with interruptions, seat of the Saxon Wettin dynasty until the Middle Ages. You will be caught by the atmosphere of the Middle Ages when visiting the guard quarters in the tower, the castle chapel, the kitchen, the dungeon and the torture chamber. In the course of its 600-year history, the most beautiful of all Saxony’s knights’ castles, Kriebstein Castle, with its Gothic hall, treasure vault, chapel, wine cellar, well chamber, deep cellar, tower attic living quarters, as well as its “Kriebsteinzimmer”, a uniquely well-preserved planked room of the early 15th cent. with colourful pictured walls, has been passed on to different owners more than thirty times. The many historical sacred and profane buildings are either embedded beautifully in the scenery or tower proudly on a rock or on one of the many hills being seen from afar – yet, are still able to take you by surprise appearing unexpectedly behind some or other path or river bend. You will also be deeply impressed by the “Göhrener Viadukt” near the village of Göhren. With its 68m height, this masterpiece of engineering represents the third biggest stone made railway bridge in Saxony. Not far from there, in the little town of Lunzenau, you will find what is probably the smallest railway museum in Germany. The landscape of the Mulde river valley around Rochlitz is dominated by the ”Rochlitzer Berg”, a mountain of volcanic origin. Due to its 353m altitude and lookout tower, it can be seen afar from any direction. But what has made the mountain really famous is its porphyry tuff – also called the Saxon marble. The red, marbled tuff has quarried for the last 1000 years now. Thanks to its uniqueness, its use – mainly for buildings – has long stretched beyond the borders of our region. At the foot of the Rochlitz mountain, you should pay a visit to Wechselburg. In this little town, you will be stunned by a late Romanesque collegiate church of the 12th cent. Beyond its own region, this three-nave pillared basilica is probably regarded as the most important building in the Valley of Castles. It is home to Benedictine monks from the Ettal Cloister in Bavaria, who moved from there in 1993. Its 750-year-old jube, capped by a very well-preserved oak crucifixion group, provides evidence of the extraordinary skills of the stonemasons. Also unique is the surrounding castle park laid out in English style. 18 hectares (44acres) of exceptional trees, some of them 200 years old, invite you to stroll around, linger and relax. From the hamlet of Amerika, both the nature reserve around Rochsburg and the town of Penig are within walking distance. Penig awaits you with its so-called Kellerberge. This labyrinth like cellar system was driven into the mountain in the 16th cent. to store beer and food and is reopened to visitors today. On the hiking route between Amerika and Penig, high above the Zwickauer Mulde river, you will pass the ‘Weiße Spitze’ (‘White Tip’) monument, which commemorates the heavy fighting at the time of the liberation wars against the Napoleonic rule. The little town of Geringswalde might be a good starting point for your exploration of the Valley of Castles or the legendary Zschopau River Valley which is just a stone’s throw away. Its nice little surrounding villages have still preserved their original country life atmosphere. For an enjoyable overview of our Saxon Downs we recommend you ascending the lookout tower. Like the Rochlitz porphyry quarry, the Waldenburg pottery guild looks back on a tradition of several centuries. Its charter from 1388 proves it to be the oldest of its kind in Saxony. Go and have a look around the historical and modern pottery workshops yourself and be on the spot when new ceramics are created. Enjoy the atmosphere on the second weekend in June each year, when a great many potters gather at the traditional potter market. Another Waldenburg highlight of a different kind is its Museum of Local History, including one of Germany’s oldest Natural cabinets. This magnificent collection of no less than 1200 stuffed animals, some with curious deformities, 6000 herbariums, 10,000 insects, mineral stones and much, much more, gives you an overwhelming insight into the development of natural science since the Baroque period. Once in Waldenburg, you should not miss a walk through spacious beautiful Gruenefelder Park laid out by Prince Otto Carl Friedrich von Schoenburg-Waldenburg at the end of the 18th cent. You can still breathe in the history of one of Germany’s oldest and most important English style parks, with its classic buildings like the mausoleum, the bathhouse and the gorgeous resident castle of the Schoenburg-Waldenburg princes. Historical village festivals, the mill and the old village school museum Alte Dorfschule in Königshain-Wiederau and the farming museums in Schwarzbach and Wechselburg – all allow you to soak up traditional country life. You can also learn about the plant and animal life of our region at the nature reserve station in the hamlet of Weiditz or about the manufacture of intarsia, a dying wood handicraft, at the workshop in the village of Sörnzig, district of the village of Seelitz. Beyond these relics of the old days, countless traces of former mountain mining activities are still present, especially in the Zschopau River Valley as, for instance, in Lauenhain, Mittweida and Schönborn-Dreiwerden. Leave your every day stress behind and relax at a lovingly restored three- or four-sided farmyard or at one of our modern, friendly hotels or guesthouses in the Valley of Castles. We look forward to assisting you in having an enjoyable and memorable experience in our region.